Sometimes, we get so caught up in trying to find aliens on exoplanets that we forget how many mysteries our own solar system contains. Fortunately, our scientists keep searching for clues to solve the puzzles in our little corner of the universe. But scientists recently found strong evidence that nanoflares, and the energetic particles produced by them, are at least part of the source of the extra heat. Although nanoflares are the tiny cousins of solar flares (which may heat solar plasma to tens of millions of degrees in only seconds), they still produce small, quick bursts of heat and energy almost constantly. We can’t see them directly yet, but that problem may be solved when NASA’s NuSTAR space telescope takes high-energy X-ray portraits of them. But scientists can’t take those pictures until the Sun is quieter; otherwise, all the energetic activity may hide the action of the nanoflares. Until then, the Interface Region Imaging Spectrograph (IRIS) gives us the best way to detect nanoflares indirectly by looking at coronal loop footpoints. A coronal loop is a hot plasma loop reaching out from the surface of the Sun into the corona that glows brightly in ultraviolet and X-rays. A footpoint occurs where magnetic loops meet the Sun’s surface. IRIS can’t see the actual coronal heating events, but it does see the telltale rapid, small brightenings at the coronal loop footpoints. While other theories have been disproven, increasing evidence points to nanoflares as the solution to the coronal heating mystery. If it’s correct, NuSTAR should see at least one nanoflare every few minutes. If it doesn’t, it’s time to go back to the drawing board. Rocks can tell us a lot about a protoplanet’s evolution because they can only be formed under specific conditions. NASA’s spacecraft Dawn recently gave us information on the puzzling dark matter that’s spread all over Vesta’s surface. It absorbs light like soot. But our scientists were curious to know what it was made of and where it came from. That might give them some insight into why Vesta started to become a planet over four billion years ago but never made the evolutionary leap beyond protoplanet. 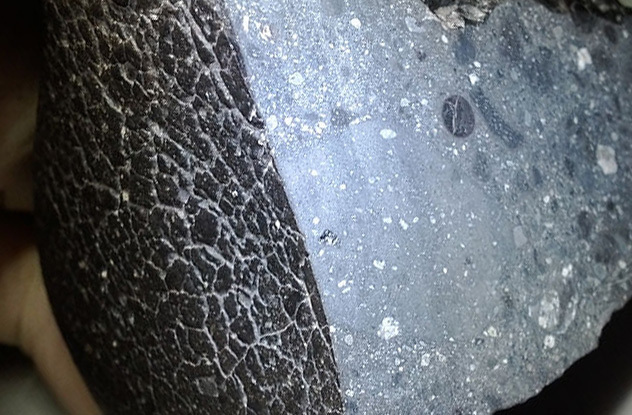 For more than a year, scientists have known that the dark material was high in carbon. But recently, they discovered that serpentine, a rock-forming silicate mineral, was an element of the dark matter. Serpentine is named for its resemblance to snakeskin. 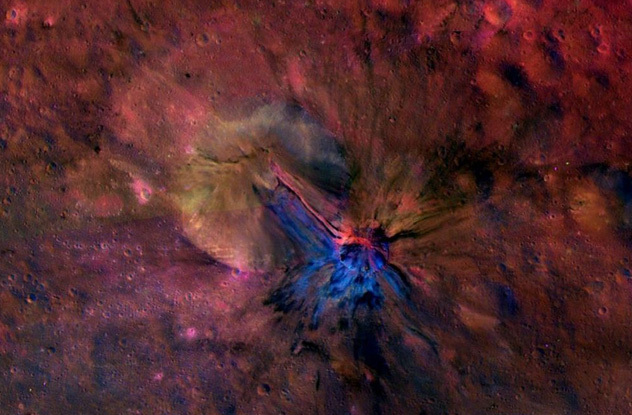 That one mineral solves some of the mystery of Vesta’s formation. The dark matter can’t have come in contact with high levels of heat because temperatures above 400 degrees Celsius (700 °F) would destroy serpentine. We already know that Vesta was quite hot at one time, so the dark matter couldn’t have come from Vesta itself. That leaves a relatively slow impact from a carbon-rich asteroid as the only logical explanation. If the impact had been high-speed, then the serpentine would have been destroyed by the resulting high temperature. The dispersion of dark material on Vesta is also consistent with a low-speed impact from an asteroid. The ionosphere is a layer of atmosphere on Venus that’s electrically charged. When the European Space Agency’s Venus Express began to orbit Venus in recent years, it was in a much higher orbit than that of its predecessor. 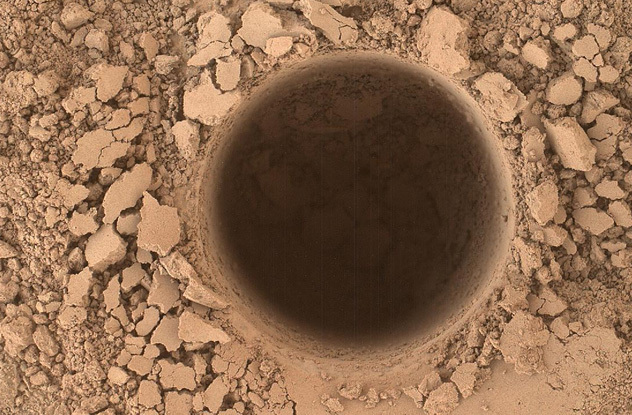 But even at the higher altitude, Venus Express saw the same holes. That meant these holes had drilled farther down into the atmosphere than once believed. 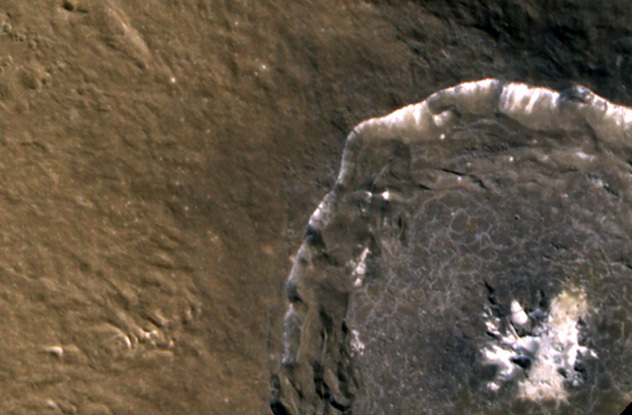 In addition, Pioneer Venus Orbiter observed the holes at the solar maximum, when solar activity is at its peak. But Venus Express saw holes during the solar minimum which means these holes are more prevalent than we realized. To interpret what’s happening to Venus, it’s necessary to understand that the side of its ionosphere facing the Sun is hammered constantly by solar wind, a stream of charged particles flowing from the Sun. The ionosphere acts like a thin boundary that extends from the front of Venus around the planet until tailing off in the back like a comet. Think of the ionosphere as the air streaming around a golf ball that’s in flight. When the solar wind hits the ionosphere, the plasma piles up, which in turn creates a thin magnetosphere around the planet. 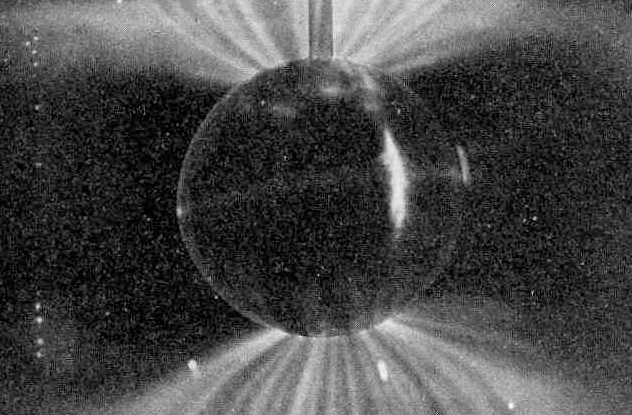 A magnetosphere is an area around a planet where its magnetic field may repel solar wind. Venus Express can measure this weak magnetic field around Venus. But it suggested that there weren’t two holes behind Venus. Instead, scientists now believe that there are two wide, long cylinders that extend from the surface of Venus into outer space. It’s possible that charged particles are squeezed out of these cylinders like toothpaste from a tube. But that raises another compelling mystery. What allows these magnetic fields to cut through the ionosphere, go down to the planet surface, and possibly even enter the planet? We may have shed light on one Venus mystery, but we ended up with another one. Auroras, light shows in the sky more commonly known as the Northern or Southern Lights, usually form when the solar wind collides with the Earth’s magnetic field, also known as the magnetosphere. In other words, it’s a visible way that we see the Sun’s effect on Earth. 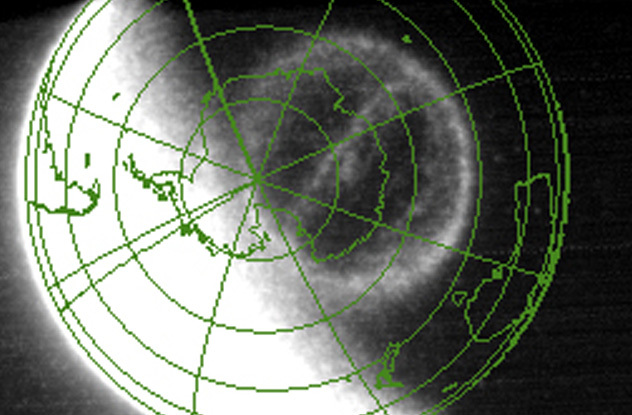 Theta auroras may form at higher latitudes, closer to the poles, than typical auroras. The theta aurora can only be seen from above, where it looks like the Greek letter theta (θ). The formation of an aurora depends on the alignment between the interplanetary magnetic field that flows with the solar wind and the Earth’s magnetic field. When the two fields intersect, the Earth’s magnetic field will point north. But if the interplanetary field is pointing south, then the magnetic field lines will point in opposite directions. This causes a process called magnetic reconnection (that isn’t yet well-understood), which realigns the magnetic field lines in a new way. The new alignment allows the solar wind particles to enter into the Earth’s magnetosphere, a huge magnetic bubble around our planet. When those solar particles flow along the planet’s magnetic field lines and collide with atoms in the Earth’s upper atmosphere, the aurora is born. In this case, the formation is most likely to take place 65–70 degrees north or south of the Earth’s equator. But theta auroras can happen at higher latitudes if the interplanetary magnetic field is pointing north instead of south. Scientists recently discovered that, when this happened, magnetic reconnection can trap plasma (which is ionized gas) inside the magnetosphere. The trapped plasma becomes hot, and this time, a theta aurora may be born. Titan, which orbits Saturn, is the only moon with a dense atmosphere. Its lakes and seas are made of methane and ethane. This unusual moon also has large, windswept dunes that are hundreds of miles long, over a mile wide, and hundreds of yards high. 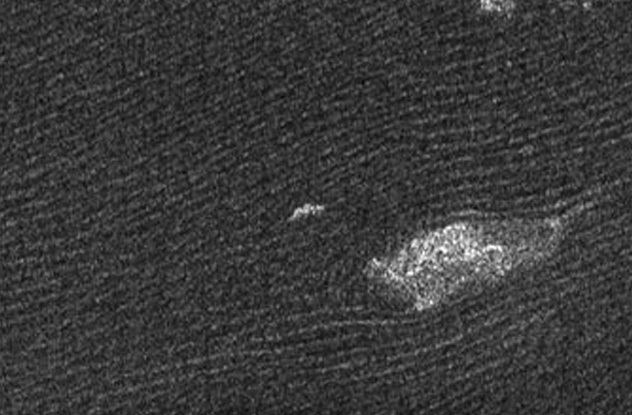 At first, the existence of dunes didn’t make sense because we thought Titan only experienced light breezes over its surface. But later research suggested that winds must be stronger than previously believed. NASA’s spacecraft Cassini also sent pictures of the particles that created these dunes. But scientists were most puzzled by the shape of the dunes. According to data provided by Cassini, the winds usually blew east to west. But the dunes around craters and mountains looked like they’d been created by winds blowing in the other direction. In a NASA high-pressure wind tunnel, Burr and her team spent six years recreating the conditions of wind and sand on Titan. Finally, they found that the wind had to blow at least 50 percent faster than originally believed to create the dunes. 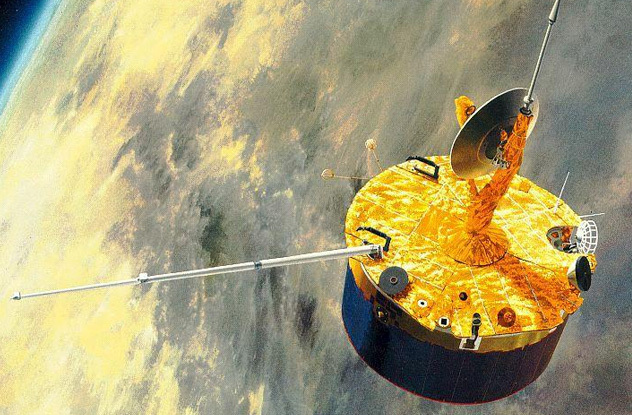 Titan’s dense atmosphere made the faster speeds necessary. Their discovery also explained the shape of the dunes. According to their model, the winds on Titan are usually light, blowing east to west, and are therefore unable to create dunes. But twice every Saturn year, which is equivalent to 30 Earth years, the wind blows faster in the other direction when the Sun crosses Titan’s equator. Burr believes those quick shifts in wind are when the dunes are created, and that accounts for their shape. Cassini may have missed these high wind speeds because they don’t happen often. Another NASA spacecraft, MESSENGER, has provided new insights into Mercury’s early planetary history. Originally, scientists believed that Mercury never had active volcanoes because it lacked the volatile compounds in its interior that create the explosions. But pictures from MESSENGER had researchers scrambling to rework their theories. MESSENGER’s photos showed the presence of pyroclastic ash deposits, which are made from fragments of rock blasted from the vents of volcanoes. So Mercury obviously had volatile compounds. But the data also showed that volcanoes erupted for much of Mercury’s history. That led to another question. Did the volatile compounds in the planet’s interior all explode early in Mercury’s history, or did the explosions occur over a substantially longer period of time? A research team from Brown University believes the eruptions happened over an extended time frame. They came to that conclusion by looking at the vents of the volcanoes. If the volcanoes had all exploded around the same time, then all the vents would be degraded by about the same amount. But the scientists observed different amounts of degradation, which is consistent with volcanic eruptions over a much longer period of time. Using the amount of degradation to determine the age of Mercury’s craters, the researchers believe that the volcanic activity probably occurred 1–3.5 billion years ago. That may sound old, but it’s actually geologically young. If the volcanoes had all exploded around the time of Mercury’s formation, the craters would be about 4.5 billion years old. This information also helps us to figure out how Mercury was formed. According to two popular theories, Mercury used to be bigger but either lost its outer layers when they were fried by the Sun or when they were torn off by a large impact shortly after the planet was formed. Given the new information on volatile compounds, neither of those theories seems likely now. Humayun and his team were surprised to find that some zircons in Black Beauty were created 4.4 billion years ago, when Mars was a new planet with an environment that may have had the ability to support life. By studying variations in oxygen atoms in these zircons, Humayun was able to extract some of Mars’s climate history like an archaeologist would extract bits of human history from artifacts and human skeletons. That’s because the zircons act like an archive of Mars’s climate change by keeping records of what happened to water vapor during the history of the planet. Humayun discovered that water was much more plentiful on Mars about 4.5 billion years ago, but then a dramatic change took place. The dry desert that characterizes Mars today has existed for a long time—at least 1.7 billion years. But if Mars was once a warm planet with abundant water, that again sparks the question: Is it possible that Mars sustained life at one time? For current climate studies, other scientists are analyzing dust devils on Mars. As we’ve talked about, dust devils are like dusty tornadoes. But that’s where the comparison to Earth weather ends. “The Martian air is so thin, dust has a greater effect on energy transfers in the [Mars] atmosphere and on the surface than it does in Earth’s thick atmosphere,” said Udaysankar Nair of the University of Alabama. In the daytime, dust in the air may block sunlight from heating the surface of Mars. At night, that same type of dust emits long-wave radiation that warms the surface. So a greater knowledge of atmospheric dust—and dust devils—should help us to develop a better understanding of Mars’s current climate. Earth is surrounded by two Van Allen radiation belts, an inner and an outer one, each shaped like a doughnut and containing high-energy electrons and protons. But in early 2014, scientists announced that NASA’s twin Van Allen Probes had discovered a strange but persistent zebra stripe pattern in the high-energy electrons in the inner radiation belt. Earth’s magnetic field holds these radiation belts in place. But Earth seemed like an unlikely culprit in the zebra stripe mystery. Most scientists assumed that increased solar wind would cause this kind of structure. But that theory was discarded when the stripes continued to be visible even though solar wind activity was low. Scientists eventually found the answer they’d previously considered so unlikely. It turns out that Earth’s rotation causes the zebra stripes. Due to the tilt in our planet’s magnetic field axis, Earth’s rotation produces a weak, oscillating electric field that affects the entire inner radiation belt. If you think of groups of electrons in the radiation belt as taffy, then the oscillations work like a candy machine to stretch and fold the taffy, which produces the striped pattern in the inner radiation belt. The Sun has rainstorms with high winds that are surprisingly similar in some ways to the storms we experience here on Earth. But on the Sun, the rain is composed of plasma, ionized gas that falls from the corona to the surface at 200,000 kilometers (125,000 mi) per hour. 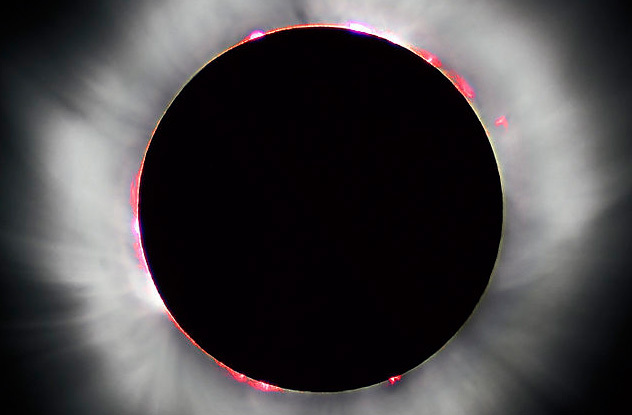 The corona surrounds the Sun like an outer atmosphere. But when it rains from the corona, it truly pours. Each droplet is as large as Ireland, and there are thousands of droplets in a coronal rain shower. Scientists have known about this plasma rain for about 40 years. But until they received detailed data from modern satellites and observatories, they couldn’t explain why it happened. This is where the parallels to Earth-based weather become striking. Under the right conditions, the Sun’s clouds of dense, hot plasma will cool, condensing until they fall to the surface as coronal raindrops. There’s also a process of rapid evaporation that forms clouds. But on the Sun, the powerful explosions of solar flares cause the evaporation. 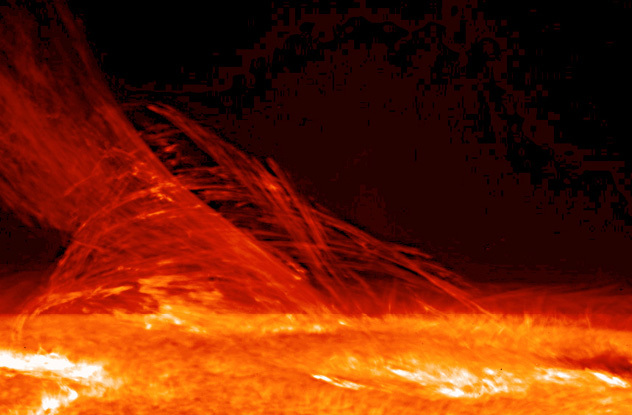 Telescopic images show that solar flares, radiation bursts on the surface of the Sun, precede solar rainstorms. Scientists believe that an unusually fast drop in temperature then causes coronal gas to morph into solar raindrops. In addition to measuring spikes of methane, NASA’s rover Curiosity discovered organic molecules in samples from the insides of rocks. The powder from a rock called Cumberland is the first definite discovery of organics on the surface of Mars. Scientists don’t know if these organics developed on Mars or were transported there by carbon-rich meteorites. NASA scientists didn’t find organics in material exposed on the surface of the planet. But that’s understandable because cosmic radiation and the ever-present perchlorates, which produce molecule-changing chlorine, tend to destroy surface organics over time. Organic molecules consist of carbon linked to other elements like hydrogen. They’re essential to life as we know it, but they don’t necessarily contain life. We don’t know if Mars ever hosted living microbes, but this tells us that ancient Mars had conditions that were hospitable to certain forms of life. Scientists needed to find three components for life on Mars: water, an energy source, and organics. By finding organics, they now have a complete ingredients list for life on Mars, whether past or present. The Cumberland rock samples also gave them important information about water loss on the planet. By examining the ratio of deuterium to hydrogen in the rock and comparing that to water vapor in the air, scientists believe that a lot of the planet’s water loss happened after the rock formed. But their analysis also suggested that Mars lost a good bit of its original water before Cumberland formed.